Burrata – fresh mozzarella stuffed with “rags” of mozzarella and heavy cream. It is a regional speciality in Italy, from the area around Bari. It is always served raw, cool, but not too cold, so all the wonderful delicate creamy, sweet, sour, and earthy flavors come through. 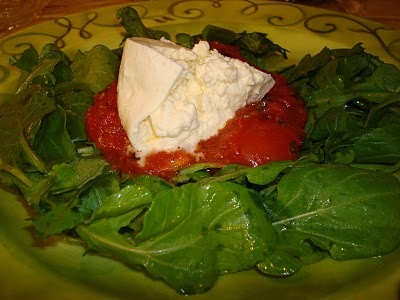 In a salad: Burrata on freshly made chilled tomato sauce, over arugula dressed with olive oil. 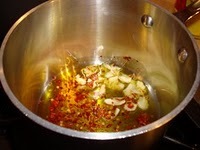 I make the tomato sauce with olive oil heated gently with garlic and red pepper flakes. Then I add crushed Italian tomatoes and finish with fresh basil, and sea salt. On bruschetta, with high quality olive oil, sea salt and fresh ground pepper. A combination I heard about from Valentino restaurateur, Piero Selvaggio. He says he likes his burrata topped with caviar. So…I gave that a try. 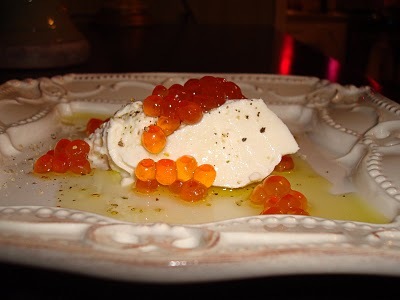 Here the burrata is topped with ikura (salmon roe). It was fabulous! We had a great time learning how to make fresh mozzarella and burrata while attending the Cal Poly Farmstead Cheesemaker course which I highly recommend for those with a passion for cheese. Burrata tip: use a serrated knife to cut the ball into quarters. A Burrata Bonus – Burrata Four Ways! 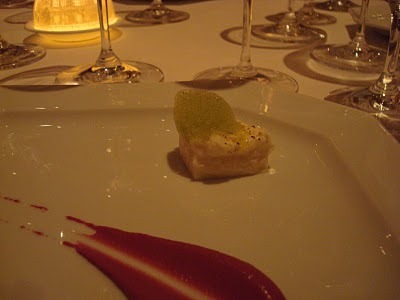 After posting about this delicious cheese, we went to dinner at Melisse Restaurant in Santa Monica. Chef Josiah had burrata on the menu…his was heavenly, topped with an ethereal basil foam. omg!! this looks so delicious!! you actually made this?? It’s a toss up to eat it on the bruscetta, or the salad!!! I never had salmon roe, they look like they would just pop open in your mouth!! 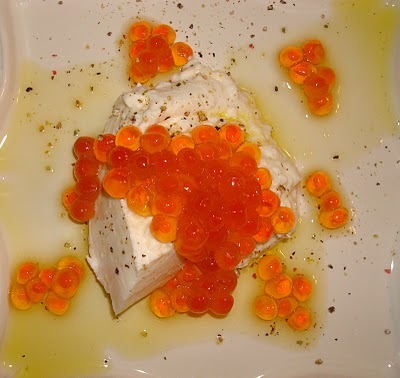 Marie – oh the roe pops in your mouth, such an interesting contrast to the creamy cheese. It really is a fabulous pairing. 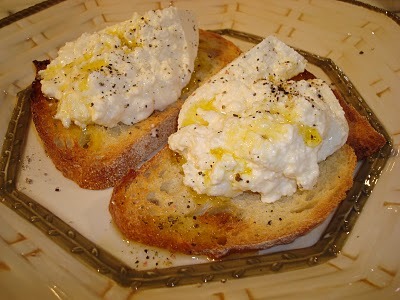 We really did make burrata at Cal Poly, but not the ones in my photos, that I purchased at an Italian market. 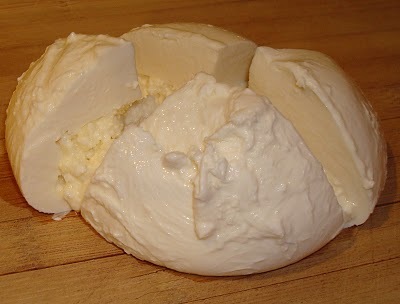 We also made Stracchino, another great Italian cheese. Oh, my heavens. I echo Simona: simply to die for. How wonderful, the cheesemaking course! I would LOVE to attend one. In fact, the former chef of a local restaurant is now working at a local farm where she’s learning the goat-cheese biz, and I’ve been thinking of asking her if I could go out there for a day and volunteer to get in the way—er, to learn something about making cheese. Anyway, your photos and all of the different preparations here are just amazing. 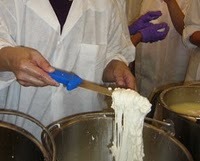 Hi Maryann and Lisa – the weeklong cheesemaker course at Cal Poly was fabulous. If you ever want to take a vacation to California, learn to makes cheeses and then go wine tasting for the weekend after you “graduate” I am happy to give you my recommendations.